The heart of Stuart has been since the 1880s and 1890s what is termed today the Historical Downtown Stuart area, one of special interest for Stuart Main Street organization. Those years of the late 19th century were truly pioneer times for the earliest settlers. There were no grocery stores, markets, electric lights, community events, churches, etc. 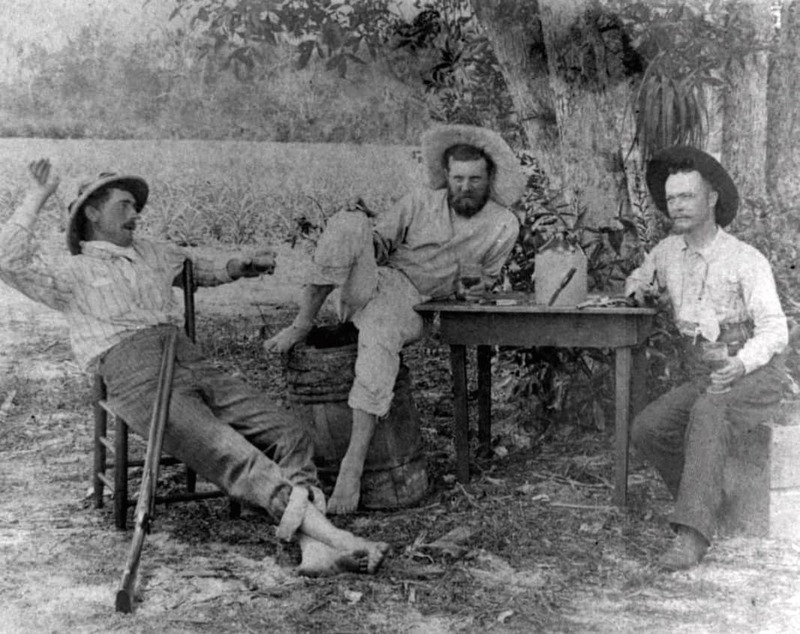 In the 1880s and 1890s there was a handful of settlers, along the shores of the St. Lucie River. Many being of German origin, when a name became necessary due to the arrival of the railroad in 1894, the settlement of about 10 families was named ‘Potsdam’ for a town in Germany. The name only lasted until 1895 due to the offensive use of the name by the train engineers when they called out ‘Dam Pots’ instead of Potsdam as they arrived at the train station. To defuse the problem, a local pioneer, Homer H. Stuart, Jr., agreed to have his surname as the village’s new name, so the name Stuart officially came into use in mid-1895. For supplies of flour, sugar, bacon, fabric, shoes, etc, the settlers were dependent the trade boats that sailed up and down the Indian River, from Titusville to Lake Worth. They came every two to four weeks so pioneers had to make due if they ran out. Trade boats might be delayed if there was bad weather. Roads were mere dirt paths and muddy if rained on, with a few having ground oyster shells on the surface but only in the wheel ruts. Life centered along the St. Lucie River. To cross the river, a ferry or flatboat operated for a fee to take people, horses and wagons from shore to shore. Even attending school was done by boat to the first one-room small school along the St. Lucie River which started in 1892. During the 1880s and to 1909, Stuart was part of Dade County whose boundaries extended to the St. Lucie River and then south to the end of the peninsula near the Florida Keys. It was in April 1909 that the upper part, including Stuart, became the new county of Palm Beach. It would remain as such until the creation of Martin County in May 1925. Settlers were not just pineapple farmers, that being the main economic activity, but also did fishing, catching green turtles for export and building boats. By late 1890s and early 1900s, a few established businesses appeared in the village of Stuart. The Walter Kitching Store was first in 1897, facing the train station. Nearby in 1901 was the George W. Parks Store and in 1902 Stanley Kitching (Walter’s nephew) had a smaller drink stand and in just three years, Stanley had a larger two-story building on the site, with a drug store, tackle shop and the Southern Express office. Along this same side was the freight depot, a small separate passenger depot and docks for boats. The Kitching and Parks families would have their homes constructed along the main road named Railroad Avenue, which was later changed to Flagler Avenue. Homes were being built on the other side of the railroad tracks in the Potsdam neighborhood (so named because the village name had been changed) and the Frazier Addition property. Lots were also sold from the Hubert Bessey property that he had gotten in the 1880s, along Atlanta Ave and St. Lucie Crescent Blvd that bordered the South Fork of the St. Lucie River. With the 1910s, the pineapple production had slowed and people were turning to different livelihoods such as increased fishing, boat building and local businesses such as garages for the new automobiles coming to the area. During this decade, the first Lyric Theater for live shows was opened in 1914 to serve a population of 700 people and was near the intersection of Osceola and Belle Flora Avenue (later named Colorado Avenue). Hotels and apartments, such as St. Lucie Hotel, Kimberly Apts, Coventry Hotel and an expanded Stuart Hotel, were built to accommodate the increase winter visitors who really enjoyed the area’s fishing. The first Stuart bank opened in 1912 and faced St. Lucie Avenue. Next came the Fereo building in 1913 to house the Stuart Drug Store, which had the first payphone and Stuart Post Office. This was the year a larger and newer passenger train station was constructed at the intersection of Railroad Avenue (Flagler Ave) and St. Lucie Avenue, which had become the main hub of the town in the late 1910s. Stuart was no longer a basic frontier village in the wilderness. Its residents were seeing it grow a steady pace. With the nudging of the first newspaper in April 1913, the Stuart Times encouraged the Stuart citizens they were ready to be incorporated as the City of Stuart and they so voted for that change in May. They established a mayor’s position, city clerk, city marshal and city councilmen. Woodmen Hall, a two-story structure was built in 1914 for the Woodmen of the World organization and as a feed store rental location. The new city did have a setback in January 1916, when a massive fire nearly engulfed most of Stuart. It resulted in the large Methodist Church, several businesses and homes along Second Street being destroyed. Yet, the determination by the citizens had everyone rebuilding even stronger structures of block this time rather than wood. That December 1916 the city rejoiced by having the first public lighted Christmas tree on display at the intersection of Flagler and St. Lucie Avenues. By 1918, a newer and larger Lyric Theatre was opened on Railroad Avenue replacing the first theater on Osceola. The close of the 1910s had the most sought after new item for Stuart, a concrete auto bridge across the St. Lucie River opened in February 1918 and then a bridge across the South Fork from Stuart to Palm City. The 1920s ushered an even greater expansion of businesses, hotels, shops, churches and entertainment for a growing population now measured at a thousand. This was the boom era for not only Stuart but most of Florida. The Fuge-Osceola building at Osceola and St. Lucie Avenue was constructed in 1921 and the Stuart Bank moved there for larger offices. With more people moving to Stuart, a larger school for all the grades was constructed by 1923 for an enrollment of 300 students. With the number of Stuart residents risen to 2,000 by late 1924, additional shop buildings and a larger post office were built in 1925, fittingly named the Post Office Arcade. Martin County was created in May 1925, breaking away from Palm Beach County, with the county seat being Stuart. A third Lyric Theatre, grander than any earlier opened up in March 1926, the elegant Pelican Hotel hosted the Florida Governor Martin and the area’s first hospital was established. The large Minschke Building opened in 1927 providing furniture for the new area homes being built. Unfortunately, this boom era came to a close by hurricanes which scared off many investors. With the Great Depression across the nation by late 1929, work was not always available as it once was and new homes and businesses did not exist during most of the 1930s. Those residents who did stay choose to remain during the good and bad times in Stuart and the once small village would recover by the 1940s, continuing to flourish over the years, yet still remembering its early history.